Istanbul, with a history that goes back to 3000 B.C., has been the capital city of the Roman, Byzantine, and Ottoman Empires. Istanbul has served as a religious, cultural, economic, and commercial center throughout history and at the same time, it is here that the foundations of industry were established. Istanbul progressed into large-scale production in the 1830's. In the first years of the Republic, industrialization was a State-executed mission. Immediately after World War II, Istanbul began to host a significant extent of private sector investments in the manufactured goods industry. From the 1950's onwards, a new generation of labor-intensive, small-scale manufacturing investments emerged, along with some large private investment enterprises. The growth of industry thus started in tiny workshops and despite the lack of resources and materials in that period, these enterprises made significant advances into the future. After 1950, the manufacturing industry in Istanbul went through a remarkably rapid development process with the onset of infrastructural investments that were needed especially in the areas of transportation and energy, and the city started to benefit significantly from loans, incentives, and public sector investments. One of the major actors in the progress during that period was the Istanbul Chamber of Industry, which was founded in 1952. Established upon the written request of close to 750 industrialists, the Istanbul Chamber of Industry kicked off its operations with its first Assembly meeting on May 30, 1952. Kazım Arın was appointed President for the first Assembly of the Chamber while Sırrı Enver Batur assumed the position of Vice President. The first President of the Board of Directors was Hüsnü Yaman, who served along with Vice Presidents Cahit Evrenos and Hasan Derman. Initially located in the "IV. Vakıf Han" building, the Istanbul Chamber of Industry accomplished major growth in a short period of time and transferred its headquarters to the second floor of Kılavuz Han in Sirkeci. With the surge in the number of its members, Kılavuz Han also fell short of catering to the scope of business in ICI. Kruger Han, where the Chamber is currently located today, was procured in 1958, and the Chamber moved into its new offices in 1963. By the end of 1963, the Istanbul Chamber of Industry had reached 2,365 members. Today, with a roster of over 17,000 members, the organization is Turkey's oldest and largest industrial chamber. 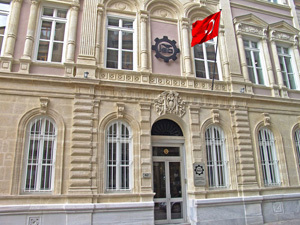 Istanbul Chamber of Industry (ICI) that continues its operations strongly with the strength gained from the contributions of its members to Turkish economy is the largest industrial chamber of Turkey with its number of members exceeding 18 thousand in 2017 and the strongest representative of the Turkish industry. The share of the value added by ICI members at factor costs is above 40 percent within Turkish industry. ICI members perform almost 35 of the total production in Turkish industry. The share of those employed by ICI members within the total employment figure of Turkish industry is approximately 17 percent. According to employment size, 79 percent of the ICI members are small scaled (with less than 50 employees), 18.3 percent is medium scaled (with 50-249 employees), and 2.6 percent is large scaled (with 250 or more employees) organizations. While most of the ICI members are from clothing industry with 22.8 percent, this industry is followed by the machinery, accessories and metal goods industry with 16.9 percent, the chemical, plastic and rubber products industry with 12.7 percent and the textile products industry with 10.6 percent. In 'The Top 500 Turkish Industrial Corporations of 2017' list, there are 174 ICI members. 'The Second Top 500 Turkish Industrial Corporations of 2017' list includes 157 ICI members. So, the total number of ICI members within Top 1000 Turkish Industrial Corporations is 331. The share of the gross added value created by the 331 ICI members in Top 1000 Turkish Industrial Corporations within the Turkish GDP is 2.9 percent for 2017. The export carried out by these corporations in 2017 corresponds to 21 percent of the total export of Turkey.